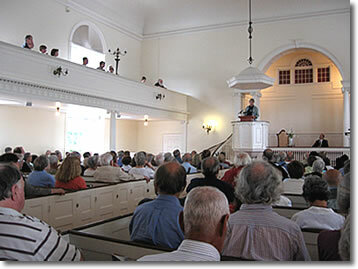 The Monadnock Summer Lyceum presents world class speakers on summer Sunday mornings in the historic Peterborough Unitarian Universalist Church. Our mission is to inform, to engage, and to inspire. Join us for enlightening presentations on social, political, educational, cultural, scientific, economic, environmental and artistic topics of our time. Enrich your summer in Peterborough, NH, in the heart of the Monadnock Region. Speakers begin at 11:00 am. Come at 10:30 to enjoy a live music performance before the talk. Selected programs will be broadcast on New Hampshire Public Radio on the following Saturday at 10 p.m. Audio recordings for each presentation will also be available on this site. All are invited to an informal reception following the presentation when you will have an opportunity to engage with the speaker. Wheelchair accessible. Devices for the hearing impaired are available. Parking is available to the left of the church courtesy of People's United Bank, in the lot on Summer Stree or on Main Street. Please do not park in the shopping plaza to the right of the church as this is not a public lot and is reserved for merchant customers. Presentations are free ~ donations welcome.